Team Anna member Arvind Kejriwal’s comments here on Saturday terming the Parliamentarians 'robbers' and 'rapists' have sparked off a huge controversy with the entire political class coming down heavily on the noted social activist. In a public awakening programme here yesterday, Kejriwal said all types of bad elements including robbers and rapists have overpowered Parliament. Addressing a gathering of around 2000 people in Greater Noida on Saturday, he said, "There are criminals, rapists and murderers running our Parliament. I think our Parliament has become a problem for us." The comments by the anti-corruption crusader did not go down well with the political parties, including the Congress and the Bharatiya Janata Party (BJP). While the Congress termed it as disrespect towards Parliament and people of India, the BJP said that it depicted the arrogance of Team Anna. 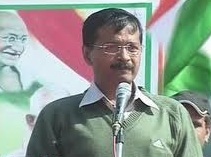 Congress spokesperson Rashid Alvi said, "We don't want to comment on such comments by Kejriwal. Such comments show disrespect towards parliament and people of India who elect MPs & MLAs. They make such comments for publicity." "This shows how arrogant these people are. It is not the right thing to say everyone is corrupt just to prove themselves right," said BJP spokesperson Mukhtar Abbas Naqvi.